The New Crew | Arts and Culture | Style Weekly - Richmond, VA local news, arts, and events. 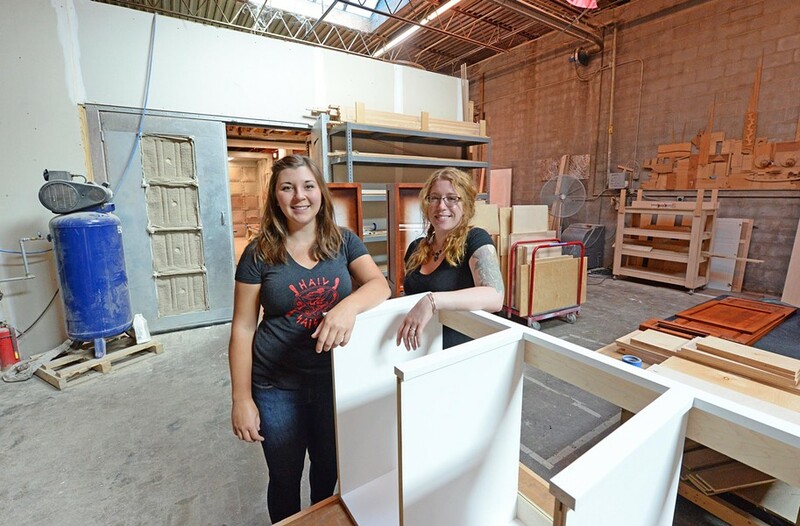 Scott Elmquist Michelle Anthony and Laura Casey have not felt any different at Martin Star Cabinetry and Design on West Main Street, though having two women woodworkers in the shop is an industry rarity. Michelle Anthony is fixing two panels of oak into a right angle in the back room of Martin Star Cabinetry and Design on West Main Street. An industrial fan circulates hot air and nearly invisible wood particles like a reverse vacuum, but she’s steadily engaged with intent precision. She’s one of two women woodworkers in the crew of about 15. It’s something she’s been moving toward since college. “It was difficult when I was deciding a major,” Anthony says. “I just liked making things.” She eventually whittled her interest down to 3-D art, before somewhat accidentally taking a woodworking class her freshman year at the University of the Arts in Philadelphia. It was one of two electives still available. She pursued a dual major — jewelry-making and woodworking — until she had to make a choice to complete her degree. She recalls lying in bed at home, trying to figure out her future, when she had an idea. The next morning she sketched it out on paper. After graduating with her degree in woodworking, Anthony had a few offers for internships in the field, but none paid. She wound up moving back to Richmond, where she grew up, worked in retail for three years, and spent six months with her family’s company, which makes and installs gutters. The opportunity to work at Martin Star came along at just the right time, she says. “I’m not sure I was immediately ready for this atmosphere right out of the gate,” she says. “It took a while. I had to work for it.” When Anthony finally got in touch with the people at Martin Star, they said she could stop by anytime. She did the next day. She started off sanding. Depending on the flow of the shop, she was placed, as needed, on other tasks, like the rest of the shop workers. Another female woodworker, Laura Casey, joined the team in March. She estimates that 95 percent of the industry is male dominated, based on her work in nine shops during the last 11 years. Unlike Anthony, Casey got into woodworking outside of school. The two became fast friends and agree that having the other around has built their confidence. “We’re never made to feel like we’re women in the wood shop,” Casey says. Nathan Gomez, one of Anthony’s co-workers, hasn’t come across too many women in woodworking in his nearly seven years in the business.